Dental Implants are usually the best way to replace missing teeth. When a tooth is missing, there are often multiple ways to replace them such as bridges and partial dentures. If you want to replace a missing tooth with something that is closest to a natural tooth, then a dental implant would be the ideal choice. A dental implant is basically an artificial tooth root that is made out of titanium, just like knee and hip replacements. There are metal free dental implants, but they are a much newer technology and have not yet proven the test of time in my opinion. 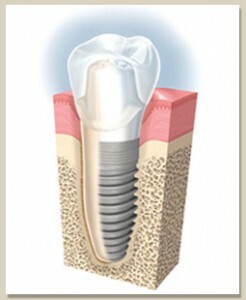 The question that I get most often from patients is ” does it hurt to get a dental implant? ” . I always tell them that I have yet to have a dental implant patient tell me that it hurt or express any regret about it because it hurt. Having a dental implant is far less traumatic than taking a tooth out in fact. There is also the very popular option of sedation so that you wake up after the procedure and its done. Once the dental implant has had enough time to heal, we then treat it pretty much like a natural tooth. We make a crown which looks like a natural tooth and cement it permanently in place. It looks a feels like any other natural tooth and you can floss and brush it just like the rest of the teeth. If you live in the Victoria, TX area and are seeking a dentist to help you get a dental implant to replace missing teeth, please call us at 361-573-7722.